Hailing from the United States, Barbara Anne is an author who has always been passionate about children’s literature. She embraces the whimsy, curiosity, and enjoyment played out on every page of a children’s book. A former early childhood educator and mother of two, now grown sons, she has devoted much of her life to expanding the minds and imaginations of children. Those experiences, coupled with her artistic ability as a lifelong DIY crafter, have fuelled her talent as a writer. In every story she creates, she hopes to inspire exploration and wonder with every turn of the page. Good memories from our childhood can evoke so many simple pleasures. I love bubbles and on occasion still play with them because of the freedom that they offer as I watch them kiss the earth and touch the sky. 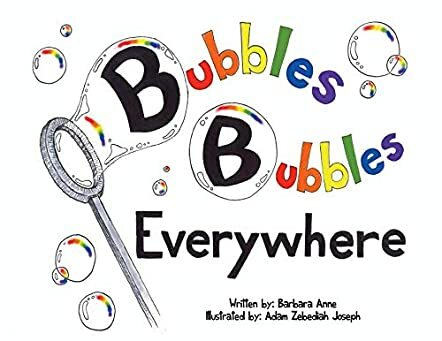 Watching children at play was the concept behind the creation of Bubbles Bubbles Everywhere by Barbara Anne with illustrations by her son, Adam Zebediah Joseph. Bubbles come in all colors, shapes and sizes and this book encourages your child to want to go out and play with some bubbles of their own. In this book your child will have fun reading about and seeing the beautiful colorful illustrations of so many bubbles. I enjoyed this book not only because I love bubbles, but more because of the passion of the author. Barbara's passion for stimulating children’s minds through hands-on activity and experimentation makes this book a win-win. In playing with bubbles, you stimulate elements of creativity in the mind of a child. Not only will your child enjoy reading this educational book but Barbara has provided the reader with the steps on how to make their own bubbles. These steps will allow your child to replicate the experiences in the book. It is highly recommended that to obtain the best experience find something to use, preferably around the house, as a wand; let your child's imagination soar. Barbara warns that your child must get the permission of an adult and that this DIY project should be accompanied by an adult. Enjoy!